An artist specializing in oils, acrylic and collage, Mary creates artwork in her studio that was originally a carriage house adjacent to the cottage. 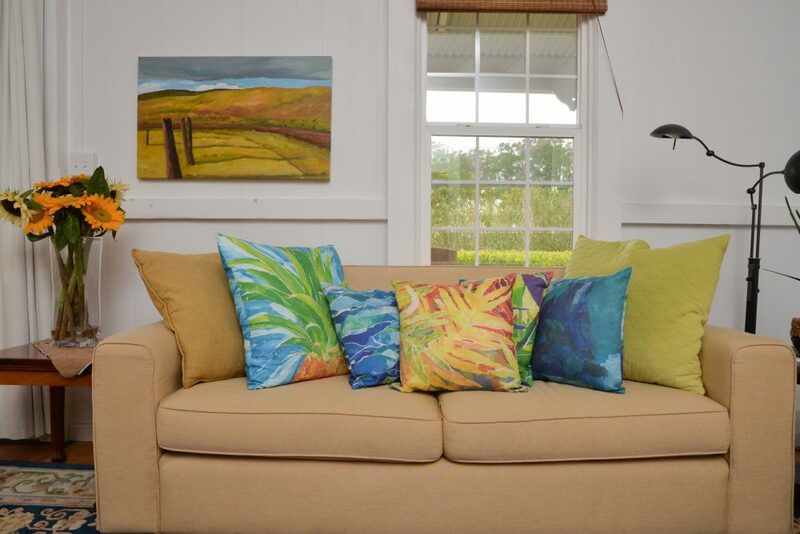 On display throughout the home and studio, Mary’s artwork pays homage to local landscapes and tropical foliage. 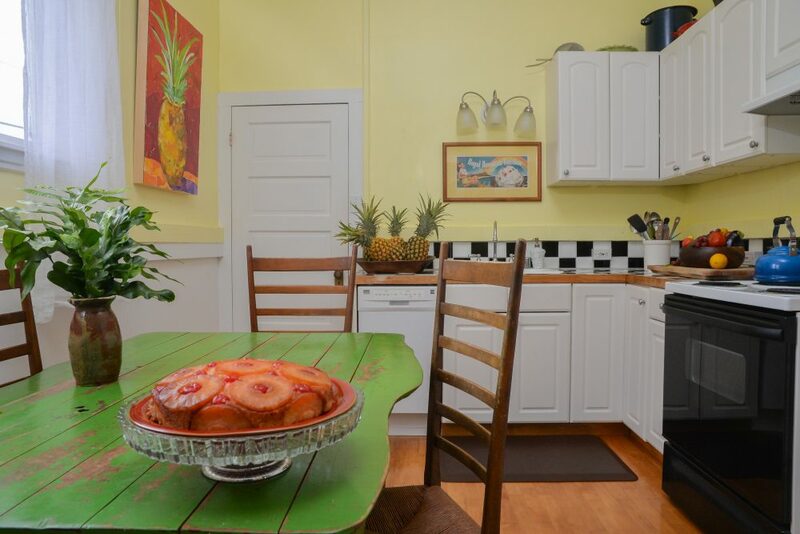 Abstract pineapple-themed collages hang in the kitchen and living room, adding pops of color to the single-wall construction. Built by Parker Ranch in the early 1920s for the local headmaster, the cottage was also home to two nuns who lived there for nearly two decades. The 12-foot-high ceilings convey a sense of volume that isn’t reflected in the small square footage. By the time Mary purchased the cottage in 2006, the aging fixer-upper needed substantial restoration. 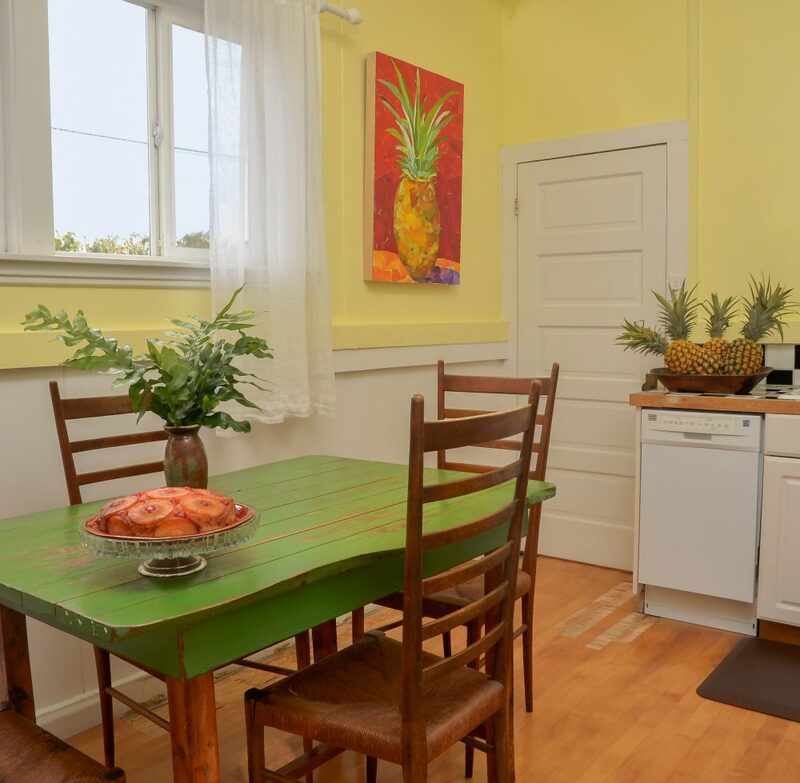 Specializing in historic renovation, local contractor Gregg Erickson transformed the dilapidated abode into the charming cottage it is today, all while maintaining the vintage character of the board-and-batten architecture in keeping with the heritage of Waimea. Mary will soon be adding a sunroom to the kitchen as well as expanding the parlor/office. Her favorite room in the house, the kitchen is the central gathering place when friends come to visit. Mary loves hearing the sounds of children’s laughter that emanate from the elementary school next door. A Big Island resident since 1989, Mary is a Masters swimmer who trains regularly at Kauna‘oa Bay and has completed many Maui-to-Lanai open-ocean team swim competitions. 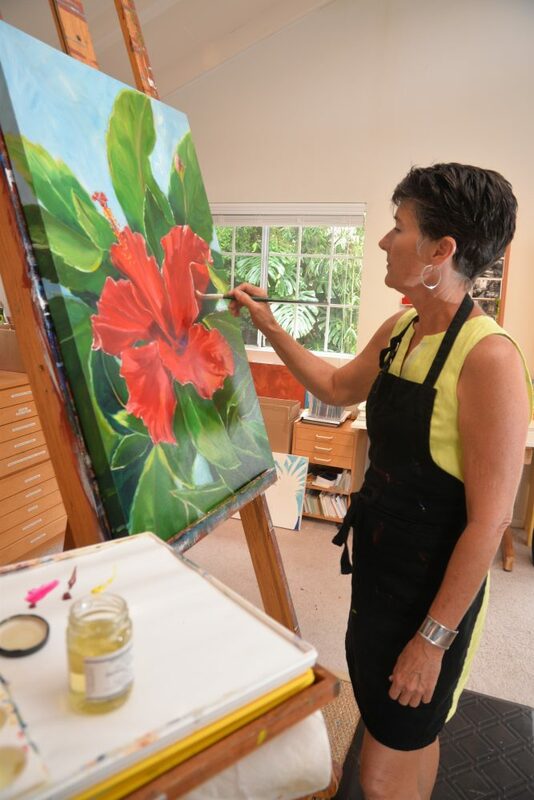 Living in Waimea provides a scenic backdrop for Mary to create her plein air style of painting. 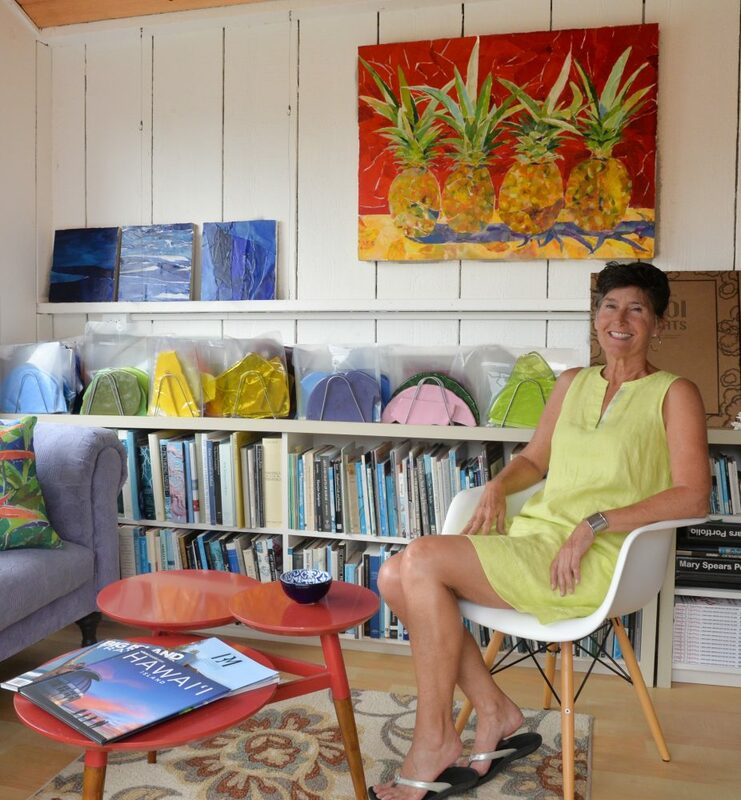 Mary’s art is showcased at Tiffany’s Gallery in Hawi, at the Glyph Gallery in Holualoa, and at the Fairmont Orchid’s artists collective. She also creates large custom murals that grace many homes on the Big Island, including inside a newly completed resort home in Hokuli‘a. 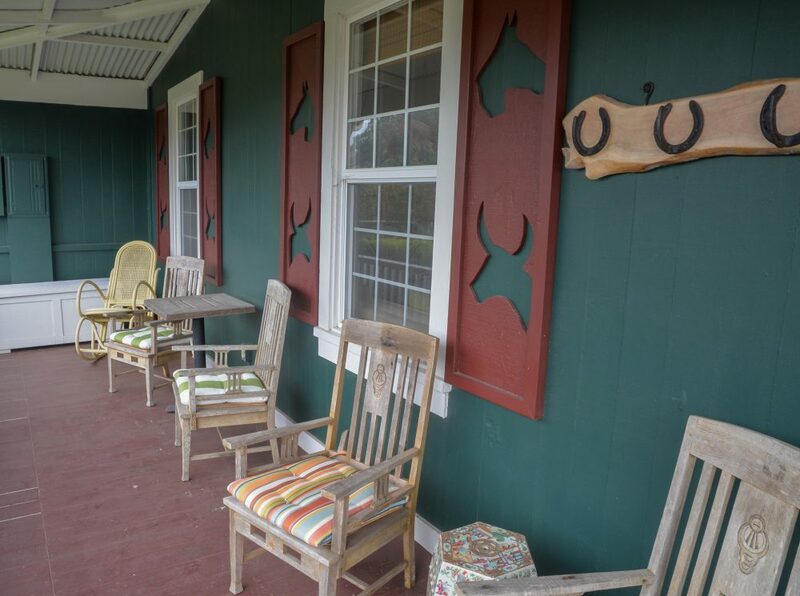 Furnished with shabby chic pieces from Bernie Moore’s former Local Color store, Mary’s cottage showcases splashes of color via pillows, bookcases, paintings and end tables. Her new 100-percent linen zippered pillows (available at MarySpears.com and at Tiffany’s Gallery) feature tropical images based on her paper collages. Home is where the art is for Mary, who relishes the beauty of her surroundings and the joyful feeling of her cottage. “I love the idea of creating something in my home, because I feel like this house is a work of art unto itself,” she said. See the West Hawaii Today, at home on HAWAII ISLAND full article.